Design Program: Create landscape design for entire property. We’re starting with the installation of the back garden which was not previously accessible other than 3’ wide pathway which ran along the back of the house. At the outer edge of the existing pathway, the soil sloped up to an old arborvitae hedge and fence. The slope was entirely full of plants. We designed a new outdoor entertaining space which is closely linked to our client’s newly remodeled home. The back garden is divided by use, public and private. On one side, we chose sand-finished concrete for dining and lounging around the fire pit with linear plantings. 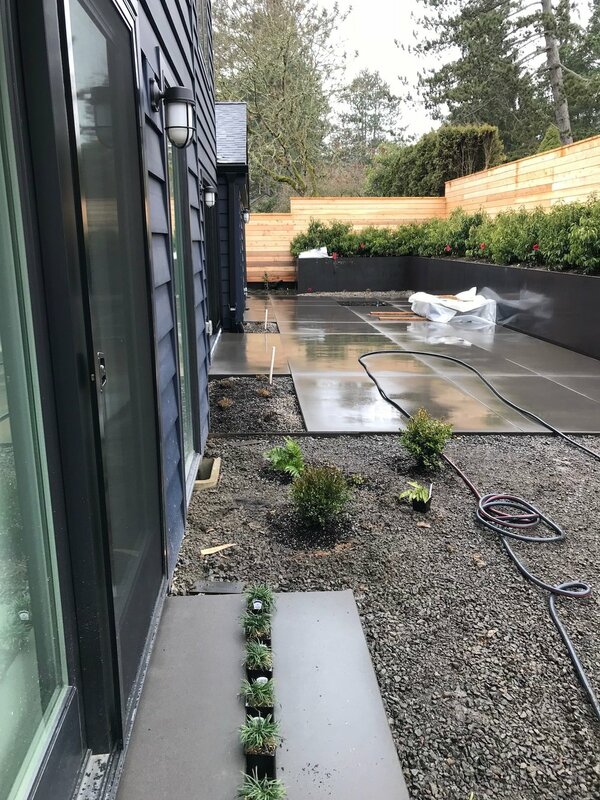 On the other side, we chose crushed stone with sparse plantings, arranged in a naturalistic pattern and a low, black steel water feature to reflect the sky.